Health care professionals working in hospice and palliative care settings can obtain certification that designates them as having the skills, abilities, and experience needed to provide quality care in this specialty practice. The CHPN® (Certified Hospice and Palliative Nurse) examination and certification was developed by the Hospice and Palliative Credentialing Center (HPCC). The HPCC has contracted with PSI Services to assist in developing, administering, and scoring of the computer-based CHPN® exam. An appointment to take the CHPN® exam at one of the PSI test centers in various locations throughout the United States is scheduled by first submitting an application. Candidates applying for initial certification must submit transcripts along with their application. Candidates must currently have an unrestricted active registered nurse license to be eligible to sit for the CHPN® exam. The second requirement to apply for CHPN® certification is a minimum of 500 hours of hospice and palliative nursing in the last 12 months or at least 1,000 hours within the last 24 months. 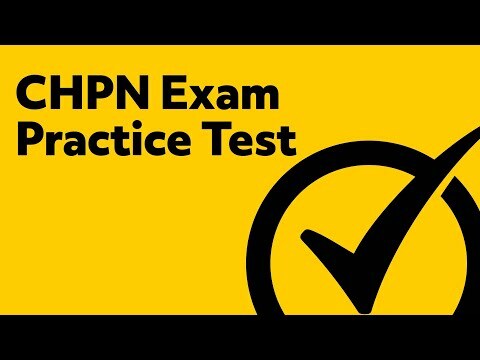 On test day, all candidates will have the opportunity to take a practice exam on the computer before beginning the timed CHPN® exam. When you are comfortable with the practice test format, you can begin the timed exam. During the 3 hour timed exam, the lower right portion of the screen will show the test time remaining. If you prefer, the timer can be turned off during the exam. If the test time allowed is exceeded, the test will terminate automatically. The CHPN® certification exam is set up in a linear format so each candidate will answer the same number of questions and those questions do not become more difficult based on answers to previous questions. If you are unsure of the correct answer to a particular question, you can bookmark it and return to it later during the test time. The CHPN® exam consists of 150 multiple choice questions. Each test includes 15 trial questions which are not included in the test score. The 135 scored questions are equally weighted for scoring. Each question will have four possible responses. The type of questions on the CHPN® exam fall into three categories: recall, application, and analysis. Recall questions account for 22% of the questions and evaluates the candidate’s ability to recall specific information. Application questions account for 60% of the test questions and evaluate the candidate’s ability to understand and apply knowledge in order to answer the question correctly. Analysis questions account for 18% of the test questions and evaluate the ability to analyze and evaluate information to determine appropriate solutions to a given situation. Upon completion of the exam, you will complete a brief evaluation and then receive your test results from the test proctor. Each candidate will receive a “pass” or “fail”. If a passing score is received, the candidate will be awarded the Certified Hospice and Palliative (CHPN®) credential. The world’s #1 test preparation company, Mometrix, has developed the CHPN Exam Secrets Study Guide and the CHPN Exam Flashcard Study System to assist you in this endeavor. The HPCC provides a Detailed Content Outline that specifies 5 domains of content that is included on the CHPN® exam. The first domain of content is Patient Care: Life-Limiting Conditions in Adult Patients (18%). The questions in this domain require the candidate to identify and provide a proper response to indicators of imminent death and to identify complications and treatments related to various disorders such as neurological, pulmonary, oncologic, and cardiac disorders. The second domain of content is Patient Care: Pain Management (22%). These questions evaluate the candidate’s ability to perform pain assessments, identify appropriate medications and dosages, identify non-pharmacologic interventions, and recognize and respond to possible complications. The third domain of content is Patient Care: Symptom Management (24%). The questions in this domain require the candidate to apply the nursing process to various symptoms and conditions such as neurological, cardiovascular, respiratory, gastrointestinal, genitourinary, musculoskeletal, skin and mucous membrane, nutritional and metabolic, immune/lymphatic system, mental status changes, psychosocial, emotional, and spiritual issues. The fourth domain of content is Patient and Family Care, Education, and Advocacy (24%). Topics in this domain include assisting the patient and their family in establishing an end-of-life care plan, compassionately explaining expected outcomes, communicating the various resources available to the patient and family, providing emotional support and education in dealing with grief and loss, and being an advocate for the patient and the family as needed. The final domain of content is Practice Issues (12%). Practice issues include topics such as coordination of patient care with other health care providers, collaborating with all care providers including medical personnel and family members, identification of services needed, incorporation of national hospice and palliative standards and guidelines into patient care, education of health care providers, and professional development. If you desire to obtain the CHPN® credential, you will want to adequately prepare for the CHPN® exam. 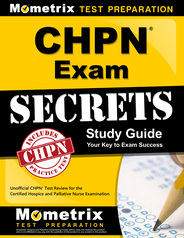 The CHPN Exam Secrets Study Guide developed by Mometrix is easy to read and includes all the material you need to know to achieve a passing score on the exam. The study guide also includes practice test questions, study secrets, and tips for overcoming test anxiety. If you benefit more from studying with flashcards then you will want to order the CHPN Exam Flashcard Study System. Our test experts have taken hundreds of concepts you must know to be successful on the test and put them in this easy study format. Don’t wait any longer. 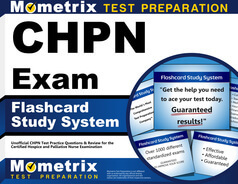 Order your CHPN Exam Secrets Study Guide and/or the CHPN Exam Flashcard Study System from Mometrix right now. We are so confident that our study materials will prepare you for success on the CHPN® exam that we offer a 100% money back guarantee. You have nothing to lose. You can trust Mometrix to help you take the next step in your career. How to pass the CHPN Exam! Mometrix Academy is a completely free CPHN certification resource provided by Mometrix Test Preparation. If you find benefit from our efforts here, check out our premium quality CHPN study guide to take your studying to the next level. Just click the CHPN Exam Secrets Study Guide link below. Your purchase also helps us make even more great, free Hospice and Palliative Care Certification content for test-takers. Our customers love the tutorial videos from Mometrix Academy that we have incorporated into our CHPN test study guide. The CHPN study guide reviews below are examples of customer experiences. Great study aide! Easy to navigate through and find the topic you want to study. I love that the test answers explain why that particular answer is the BEST choice. I recommend this book to anyone preparing to take the CHPN! This was by far the most helpful of all the study tools I used to prep for the certification exam. The review information was clear and pretty much exhaustive. The practice exam questions were in line with the actual exam. I scored an 80% on the practice questions, and 85% on the actual exam. I love this book and these products! Mometrix came highly recommended to me by my nurse educator. It’s an amazing book that is not overwhelming and extremely useful! Very thorough, but doesn’t act like its reworking the wheel. I feel much more confident with this study guide than any other. I recommend it to everyone! Thank you for putting out a great product!! May actually get certified in more things as long as there is a book for it! This study guide is an amazing resource for current and future hospice nurses. The breakdown is simple and easy to follow. This resource breaks down various topics from symptoms of active dying to treatment for agitation and types of pain. Anyone looking for a review of nursing topics can benefit from reading this study guide. I was impressed with how much important information was inside this small easy to read book. It revealed specifics that is needed to feel confident enough to take the test. I am grateful for this study guide. Thank you so much! This was a great study guide for review for the Hospice and Palliative Care Certification Exam. It’s a great global tool in the care of the Hospice and explain the rationale for regulatory processes. The flashcards that go with it is a must–you can review what you know in small sections each night–makes retaining the information that much easier–well worth the investment. I have been studying for months but was surprised to see how much this book covered that I hadn’t run into elsewhere including some meds I wasn’t familiar with. I like how this book organizes the various topics. I also appreciate how they sum up each topic in one easy to understand paragraph. The 150 question sample test has fresh material. The study strategies will be part of my new regimen up to testing day. I’m very thankful for this book. I do feel that my score will be better because of this book. The CHPN Exam Secrets study guide is an excellent product to help nurses become certified as Hospice or Palliative Care specialists. The guide presents complex medical topics in a clear straightforward manner. Topics include: Life limiting conditions,AIDS,dementia,pain management, end of life concerns and professional issues. I found the topics to be thought provoking and very relevant to the issues we currently face in the medical community. It also contains additional bonus material that will help all who are preparing for this test. This study guide gets my heartfelt endorsement. I believe anyone wanting to pass the the CHPN exam should get a copy of this study guide as soon as possible and begin using it right away. No book can help someone who refuses to study, but I honestly believe this book will be of tremendous value to everyone who is diligent about preparing for the CHPN test. It consists of two parts, both of which are extremely valuable. The first part focuses on taking the mystery out of standardized tests, along with the anxiety most people feel when taking them. It truly demystifies these tests and they seem a lot less intimidating after learning these things. The second section is all about reviewing the questions and topics found on the CHPN. It’s very thorough, and can reveal a lot of weak areas and blind spots. I recommend this product as a great investment to all nurses who want to earn their CHPN.